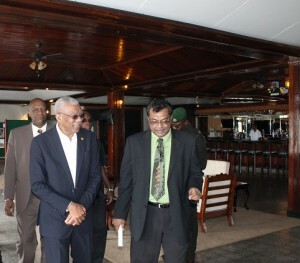 FLASH BACK: President David Granger and Minister of Public Security, Khemraj Ramjattan. In the background is Minister of State, Joseph Harmon. Despite an apparent schism in the Georgetown City Council between the Alliance For Change (AFC) and A Partnership for National Unity (APNU), the relationship between the coalition partners at the leadership of central government is “cordial”, AFC Chairman, Khemraj Ramjattan said Wednesday. The People’s National Congress Reform-dominated A Partnership for National Unity A(APNU) did not support AFC member, Lionel Jaikarran to continue as Deputy Mayor and instead nominated and seconded Councillor Akeem Peter of APNU to be second-in-command to Mayor Patricia Chase-Green. Jaikarran recently seconded a no-confidence motion against Town Clerk, Royston King. Ramjattan admitted that his party’s stance against the controversial parking meter project might have resulted in APNU controlling both the Mayor and Deputy Mayor positions, but said democracy must be respected. “It is a democratic decision and we have to learn to live with democratic decisions and indeed, I rather suspect that those who voted the way they did, didn’t like the principled positions of Sherod and Dr. Jaikarran and so if they have the majority in that Council and they want the new guy- Peter- well they will have him,” he said. Ramjattan, who was an executive member of the now opposition People’s Progressive Party (PPP) said positions should not be taken based on emotions and irrationality. He reasoned that the differences at City Hall appeared to be driven by personality, something he said is also feature of single parties instead of only coalitions. He said the APNU+AFC ministerial Cabinet has been able to address its differences in a professional manner and emerge with a collective decision. “In our coalition government, I have to say that we have had our disagreements but we dealt with it very professionally and we thrash them out. We come to middle ground and we debate, we debate very heavily in Cabinet,” he said. The AFC Chairman restated his party has already decided that it would contest Local Government Elections with APNU, but a number of matters such as candidates have to be ironed out. Now that the AFC has written to APNU Chairman, President Granger, a meeting would have to be held with AFC Leader, Raphael Trotman to iron out those issues. “I think there will be some developments this week”, he said. At the 2016 Local Government Elections, AFC had expressed concern that it had not been allowed to provide 40 percent of the candidates for the municipalities in keeping with the spirit of a February, 2015 political agreement with APNU for the general elections that were held in that same year.